There are numerous aspects of the Unemployment situation that I find highly noteworthy. If one assumes that the “true” Unemployment Rate is 20%, as per above, that in itself is outsized from a historical perspective. One would have to look back to the worst period(s) of The Great Depression to see such (stated) Unemployment Rates. Also, for all of the hardship this unemployment situation is causing, it doesn’t seem to be causing undue concern or focus. Perhaps the vast majority has adopted the traditional view, one that economists routinely site, that Unemployment is a lagging indicator and thus the problem will improve as the purported economic recovery progresses. Another facet of note is that the stock market valuation seems incredibly high when compared to the Unemployment Rate. While this dichotomy may last temporarily, I would expect a definite “resolution” to close the gap. This entry was posted in Unemployment and tagged unemployment rate on October 30, 2009 by Ted Kavadas. This entry was posted in Uncategorized and tagged homeless children, poverty on October 29, 2009 by Ted Kavadas. There are several interesting facets of the markets right now. I will soon comment on some of them. “Remarkably, the Oscillator hit a deeply oversold reading yesterday, nearly 2 standard deviations below its 70-year average. At a current level of -73, the Oscillator is giving off one of its most oversold readings since the March bottom…even though the S&P was within 1% of a new 52-week high at one point during the session. This entry was posted in Stock Market and tagged McClellan Oscillator on October 28, 2009 by Ted Kavadas. 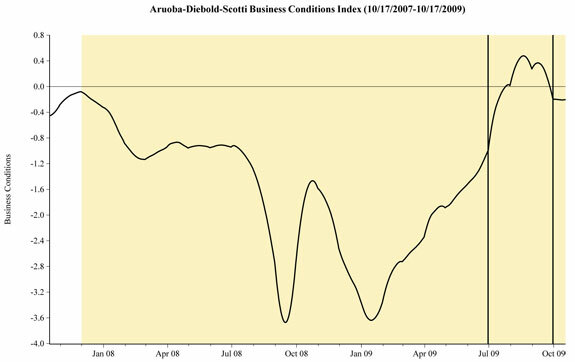 “The Aruoba-Diebold-Scotti business conditions index is designed to track real business conditions at high frequency. Its underlying economic indicators (weekly initial jobless claims; monthly payroll employment, industrial production, personal income less transfer payments, manufacturing and trade sales; and quarterly real GDP) blend high- and low-frequency information and stock and flow data. Both the ADS index and this web page are updated as data on the index’s underlying components are released. At this point, I don’t have a lot to say about this index. I do find the latest downturn from about mid-August to be notable. Also, it would be interesting to see how this index compares historically to the S&P500 as well as the other index and forecasts I have previously discussed on this site such as the ECRI WLI, Fortune Big Picture Index, and Dow Jones ESI. This entry was posted in Economic Forecasts and tagged ADS Index, Aruoba-Diebold-Scotti Business Conditions Index on October 27, 2009 by Ted Kavadas. Readers of this blog will know that I don’t agree with many of the statements and forecasts found in this testimony. However, I am calling attention to it because it has several notable passages, as well as forecasts. This entry was posted in Economic Forecasts and tagged Christina Romer, Joint Economic Committee on October 26, 2009 by Ted Kavadas. The first part of the interview deals with his views on the economy. Although I don’t necessarily agree with his views, I did find the interview to be interesting on various fronts. This entry was posted in Economic Forecasts and tagged economy, Warren Buffett on October 23, 2009 by Ted Kavadas. As I have discussed previously, double-digit percentage declines in corporate revenues is a serious issue. Many well-respected, broadly-based companies have posted double-digit percentage revenue declines for 3Q. This is highly significant in that we are purportedly in an economic recovery; as well, 3Q 2008 should provide a (relatively) easy comparable period as the economy was struggling. This entry was posted in Business and tagged double-digit revenue declines on October 22, 2009 by Ted Kavadas. I have commented on Moral Hazard previously on this blog. As I have noted, there has been very little (especially relative to the size of the issue) commentary or attention given to the issue. I believe the Moral Hazard issue is of the greatest importance. Moral hazard should have been addressed via credible policy many years ago. I am certain that by neglecting this issue we will see immense damage. This entry was posted in Moral Hazard and tagged Moral Hazard on October 21, 2009 by Ted Kavadas. I found it interesting for two main reasons. First, it discusses the concept of the “Crowded Trade.” This is a phrase that isn’t often heard these days. Nonetheless, I think the concept is important to consider, especially in today’s investment environment. “The remarkable thing about the stock market is ‘the absence of volume associated with it’,” Hendry said. This entry was posted in Investor and tagged crowded trade, rally volume on October 19, 2009 by Ted Kavadas. Lately there has been quite a bit of activity in either increasing or proposing increasing taxes (also increases in fees, fines, etc). This activity is occurring at all levels, i.e. local, state, and national. These tax increases are very noteworthy given our current period of economic weakness. I will be addressing various aspects of this in the future. This entry was posted in Uncategorized and tagged current economic situation, national debt, tax increases on October 16, 2009 by Ted Kavadas.